The Varsano Villa is located only 1 mile from the lake and 3 short miles from Bear Mountain Ski Resort. Click on the LOCATION MAP for details of the rental home's proximity to points of interest in the Big Bear Lake area. 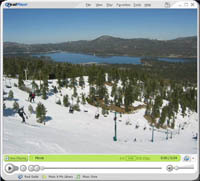 The Big Bear Lake area in the San Bernardino Mountains is a year round resort. A convenient mountain retreat with fresh air, a beautiful alpine landscape, and a relaxing natural atmosphere, it is the perfect weekend getaway from the bustling urban life. 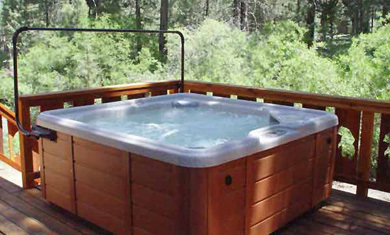 Soak in the Varsano Villa's outdoor jacuzzi spa or swing on the hammock amongst the tall pines and giant sequoia's and feel your stress melt away. For the active outdoors person, the Big Bear Resort area features skiing, snow boarding, sledding/inter tubing, and snow shoeing in the Winter. During the Spring, Summer, and Fall, enjoy hiking, cycling, boating, fishing, swimming, go-karting, alpine & water sliding, camping, shooting, and horseback riding. The Big Bear Village and Big Bear Boulevard offer a plethora of shopping and dining experiences. Whether you like to search for antiques or bring your family to the Moonridge Zoo, there are plenty of activities to keep everyone happy.